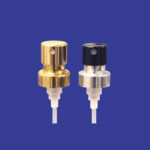 Fragrance and perfumes are the most popular products being dispensed with our new and improved crimp finish sprayer pumps. These fingertip sprayer pumps are extremely popular for body sprays, eyeglass cleaners, breath sprays, vitamin sprays, room and car air fresheners, disinfectants and hundreds of other products where a controlled fine misting spray application of product is necessary. These low profile reduced housing pumps offers a lower cost alternative to screw-on pumps, yet provides an upscale look to your finished package. 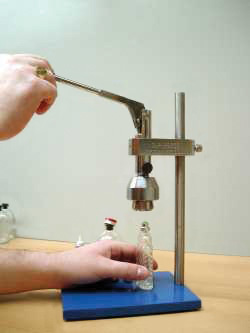 This tamper proof package can be filled on high speed filling lines or can be manually crimped with a hand or tabletop crimping machine such as the one pictured below. The new lower profile pump pumps fit virtually any bottle and over cap combination and with the newly improved mechanism spray with less effort and with a consistent spray pattern and since quality and reliability is more crucial on a crimp finish pump than any other type of dispensing mechanism, we only stock domestically manufactured pumps in the USA that have been made under strict ISO 9001 standards for years. If you have ever tried to remove a defective pump from a bottle or can once it has been crimped, you understand how crucial buying the most reliable crimp finish sprayer pump is and how much money you will save in the long run. Actuator buttons available in stock in white, black, or natural plastic as well as gold or silver metal sleeved. Custom colors in either plastic and metal sleeved versions can be made to order. * Dip Tubes can be made to any length. Now there is finally a lab style crimping machine that takes seconds to set up and significantly reduces breakage of pumps and bottles due to its unique design. This crimping machine produces the finest quality crimp we have ever seen in sizes from 13 mm to 20 mm. The secret to this machine is the high quality crimp head, which simply screws into the lab press by hand. The crimp head is machined to precise limits and is then hardened and coated to give long life and smooth, trouble-free operation. 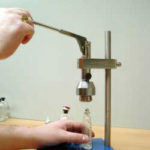 The head exerts pressure on the side of the pump rather than pushing down on the bottle which gives it a cleaner crimp with less pump and bottle damage. When the lever mechanism when is pulled down the crimp head generates extra pressure with less effort, making crimping easier and therefore increasing production. Whether you are looking to make small production runs or you just need a crimping machine for lab samples, this machine will fit your needs!